Did You Know You Can Get a Unicorn Hunting License...FREE? Did You Know You Can Get a Unicorn Hunting License…FREE? This is not a joke...you can get a Unicorn Hunting License. I know because...I use to send them out. It was the weirdest summer job I ever had! Nowadays it's much simpler to get a license, you can just download 'em. But back then, it was my summer job! (Scroll down for the link to the license download). 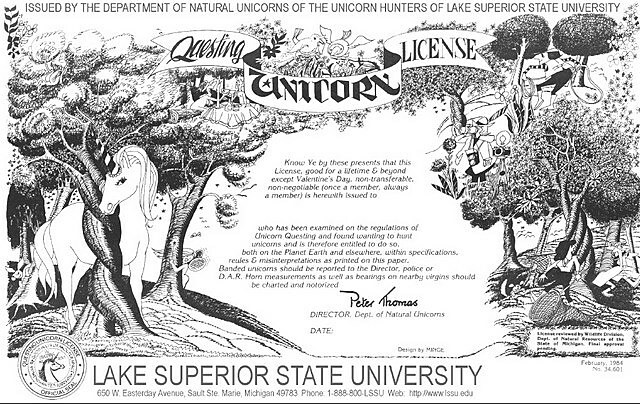 My father did a lot of unusual things to get media attention...one of them was starting the Unicorn Hunters of Lake Superior State College in Sault Ste Marie, MI. Later, bowing to UPP (Unicorn Public Pressure, the PC of the Unicorn world) the name was changed to the Unicorn Questers. In the summer, when all the students were gone, the Rabe Kids would work in my dad's office, sending out whatever huge mailing was going out. Mostly it was press releases, but sometimes it was Unicorn Hunting License Day. A few days after my dad would be on radio, TV, or in the newspaper, the office would get a TON of requests for a license. Sometimes hundreds. Which made for the weirdest summer job ever, mailing Unicorn Hunting Licenses to people all over the world. Click the picture there to see the larger version. What was the weirdest / worst summer job you've had?